And now, on to Sunday’s shows. By the way, don’t worry if you missed some Fringe shows. Some of the best of the best of the Fringe will be extended into July; check the Hollywood Fringe Festival (FB) website for extension information. I’ve noted before that a common characteristic of almost any Fringe festival is the solo show. Sometimes, this is a show where a single actor portrays a single character, as I saw in the excellent Ingersoll Speaks Again! early in the Festival. Often, however, the solo show is biographical, where the performer wants to impart a particular message or lesson based on their experience to the audience. Over the years, we’ve seen a wide variety of show shows; I recall one last year my wife just loved. This year, we’ve seen a broad range. In one, the performer came across as unprepared, and her message was muddled as a result (luckily, I’ve heard that although she was upset at my review, she’s taken my comments to heart and is improving her show — which makes me happy). The second solo show of this type was a bit muddled and needed some tightening, but did get its message across. The third was simply spectacular, although was a bit less autobiographical. I’m pleased to say that the last show of this type I saw, A Reasonable Fear of Tubas, hit that sweet spot: a well-done autobiographical show that got its message across well but didn’t overstay its welcome. 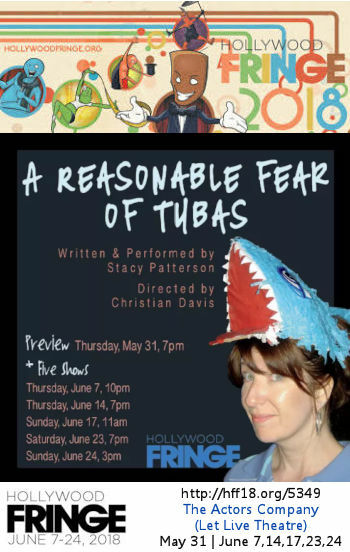 In A Reasonable Fear of Tubas, author and performer Stacy Patterson (FB) tells us the story of her life, presenting numerous entertaining incidents that provide the basis for her assertion that she was reasonably fearless. She tells stories of situations where friends would have flinched, of not being afraid of heights, not being afraid of this and that. All these stories provide the basis for her exposure of her crippling fear, that came across in 1975 when she saw (insert music cue), the movie Jaws. That awakened her fear of sharks, and that fear began to cripple her near any body of water — first at the coast, then inland, and then even on TV, because — well, you know — cartoon sharks. But she then turns to the facts on sharks, and how so many of them are just killed for their fins, and then tossed to die and suffocate in the water. She doesn’t indicate whether she can now accept sharks, but she does note that she is no longer crippled by them. She then goes on to explain the title: what made sharks extra scary in the movie was not the shark itself, but the music — intentionally played by tubas out of key to amplify the fear. Throughout the production, she is presenting slides from her childhood, which come up when she expects them to come up. More over, she’s not using the slides to tell the story (as I would with a Powerpoint); rather, the slides just illustrate the incident she has just told (for example, her at the top of a tall tall tree). She’s entertaining, energetic, and most importantly, knows her story and tells it without reference to anything else. It was just an entertaining show. About the only drawback to the show was the lack of any program. The “program” such as it was, was the show’s advertising postcard. That tells me nothing about the experience of Ms. Patterson; I only know what I learned from the show (and what I have learned subsequently writing up this post). The show was directed by Christian Davis. There were no other credits provided; in particular, no stage manager or technical support credits were provided. Sunday was the last performance of Tubas; I have no idea if it is being extended by the venue. I’m not sure how all of those particular aspects of beat culture came across in the musical itself; certainly, most of the stereotypical aspects of beatniks and beak culture weren’t there (i.e., dressing in all black, turtlenecks, etc. ), except for the heavy smoking. In the musical, the beat generation came across as one obsessed more with poetry and writing (back when you could earn as much as a folk singer by being a poet), and with the exploration of life and feelings. At this point, I would normally attempt a synopsis of the story. That’s difficult, as there was a bit of convolution to it; further, the program itself provides little after-the-fact memory jogs such as a song or scene list. That could be intentional, as the story still still in development. The story appears to start off with two friends, Audre and Diane, who are heavily into the poetry scene, discussing life in college as they are about to head off to different college. Each has different literary aspirations. Once the story moves to college, the story centers around two main groups of characters attempting to find their way in the beat generation, make a living, get published, and pay the bills. One revolves around friends Joyce and Elise, which Joyce being the main point of interest. Joyce becomes friends with publishers LeRoi and Hettie; they introduce her to Jack. Jack swiftly hooks up with Joyce, before going off on the road for a long distance romance. Meanwhile, Elise has started to hook up with another beat poet, Allen. Allen has been serving as muse to Diane, encouraging her career while’s hooking up with a fellow beat poet, Peter. Diane becomes pregnant, has the baby, but attempt to keep writing poetry while balance motherhood along the way, still getting published and keeping in touch with Audre. They all come back together at the end. So here’s the problem; The musical focuses on all these real characters. It pays a lot of attention to real relationships that developed between subsets of the characters in real life, and it is clear all — or most — of the characters knew each other at some point. So is this a real story, based on research? Is it a version of Million Dollar Quartet, where it is an imagined interaction between the characters? To what extent is this fictional; and if it is, where are the fictional characters? Further, being built around real characters makes it much harder to have a protagonist who has a quest or a want for something, and goes on that journey to achieve it, finding something else along the way. None of that is made clear. However, it doesn’t need to be … yet. This is a Fringe musical, in its second mounting (the first was in the UCLA Botanical Gardens). It still has a substantial gestation period and dramaturgy to go through prior to a major mounting. For what it is, the maturity was remarkable. The music itself was pretty strong, although a few songs sounded similar. I particularly liked the “Land of Cardigans” song about Barnard, and the number sung by Kerouac on the ukulele about the blues. For the most part, the songs seemed not to be novelty numbers; they did what songs in a musical should do — move the story along. I’ll note that the group developing this musical is all out of the UCLA Musical Theatre program; as a UCLA grad myself (BS ’82, MS ’85, School of Engineering), I can confidently say the high quality must be in part from the excellent education they received there 🙂 ). Another thing that was strong were the performance. In what I would characterize as the lead female positions were Rachel Berman (FB) as Diane di Prima, and Roxy Seven (FB) as Joyce Glassman. Both were remarkable — strong voices, strong performances, strong characterizations. I was particularly taken with the emotion that came through Seven’s voice, and with her facial expressions. Both were delightful to watch. On the male side in leading positions were Matt Curtin (FB) as Allen Ginsberg and Brady Richards (FB) as Jack Kerouac. Curtin captured the neuroticism of Ginsberg well and gave a strong performance. SImilarly with Richards; I was also impressed with his singing and ukulele playing, which worked very well. Supporting the female leads were Nola Faye Dodd (FB; IG) as Elise Cowen and Autumn Sylve (FB) as Audre Lorde. Both inhabited their characters well and had strong vocal performances. Rounding out the somewhat larger performances were Scottie Nevil (FB) as Hettie Jones, and Dennis Woullard (FB) as LeRoi Jones. Both gave strong performances and had good voices, although Nevil could use a bit more strength behind hers. Rounding out the ensemble in smaller roles were Kyle Frattini (FB) as Neal Cassady, and Charles Platt (FB) as Professor Williams / Peter Orlovsky. Music direction was by Mina Bloom (FB), who also played piano and helped workshop this production in 2017 with her Dually Noted Theatre (FB). Rounding out the band were Austin Chanu (FB) [Saxophone, Clarinet, Flute]; Kyle Lesh (FB) [Guitar]; Marion Meyerson (FB) [Bass]; and JJ Ross (FB) [Drums]. There was no choreography credit; presumably, the dances and movement were developed by the director, Davia Schendel (FB, IG), as yet another hat. As this was a Fringe production, the scenic aspects were limited by time and budget (although the Beatniks team can always use your donations). Costumes were by Jared Davis (FB), and were surprisingly not black or bereted (i.e., stereotypical beatnik). Phoebe Balson (FB) was the stage manager. This was the last performance of Beatniks at Fringe, unless they get an extension. This is a show that I expect will continue, as it shows quite a bit of promise. I’m sure they can use any donations to help them on the way.